New Delhi: Popular American streaming platform Netflix Inc. has topped the list of video streaming apps by revenue in India for the last 18 months, according to data shared by App Annie, a mobile app data and insights firm. The rankings are based on data collected across the iOS App Store and Google Play. The second largest revenue earner in India is Hotstar, the digital platform of broadcast network Star India Pvt Ltd. Although App Annie gives the rankings, it does not share the actual revenue earned by these companies. Star launched Hotstar in February 2015 while Netflix entered the country in January 2016 with a content subscription plan of Rs500 per month. The video streaming service also offers two other plans priced at Rs650 and Rs800 per month. Hotstar, meanwhile, offers the Indian content free but charges a monthly fee of Rs199 for popular international series like Game of Thrones and films, largely from the 21st Century Fox library. “We’re seeing that Indian users are becoming increasingly engaged with video streaming apps on the back of strong adoption of mobile devices and major improvements to cellular coverage. As greater device affordability will be the main driver of increased smartphone adoption and engagement, mobile data will continue to be the dominant mode of access for internet services, including video," said Jaede Tan, regional director at App Annie (India & Southeast Asia). Revenue growth in the market demonstrates Indian consumers’ willingness to use in-app purchases to pay for premium content and subscriptions, Tan added. Netflix declined to comment on third party data. Hotstar, which has consistently topped viewership rankings in India, took the second spot in revenue rankings for the last 18 months followed by ALTBalaji, the streaming platform from film and television production house Balaji Telefilms Ltd , Eros Now and Wynk Movies. Hotstar did not respond to calls from Mint. “For us it’s original exclusive Indian content which can be accessed on our app only. We have got established TV actors like Ram Kapoor and Sakshi Tanwar plus Bollywood actors like Nirmat Kaur and Rajkumar Rao doing shows for us. Our shows stretch across psychographics—related to the tendency of a person to consume content—and across geographies," said Nachiket Pantvaidya, chief executive at ALTBalaji. He added that telcos providing internet at cheaper costs have also propelled video consumption. ALTBalaji was launched in April 2017 as an advertisement-free, subscription-based service. In terms of monthly active users, Hotstar continued to lead the pack in the last three months to September, followed by JioTV and JioCinema from Reliance Jio Infocomm Ltd, according to App Annie. This data was collected across Android phones. YouTube was excluded because it’s pre-installed as part of Android but if it were to be ranked, it would have been number one. Amazon Prime Video and Voot from Viacom 18 Digital Ventures swapped positions to take the fourth and fifth positions, respectively. At number six, Bharti Airtel’s video streaming app Airtel TV made its debut in the top ten rankings for video apps by monthly active usage. “Airtel TV has a strong customer pull as a single platform where they can find content from several different partners such as Eros, Sony Liv, Hooq, etc. With the addition of Live TV, we have seen a jump in usage. The platform is still evolving and as we add more and more features and platforms, we expect to see further increase in engagement levels," said Kartik Sheth, chief executive, Wynk. To be sure, Wynk Movies has, over the last six months, transitioned to Airtel TV to become part of the same video platform. 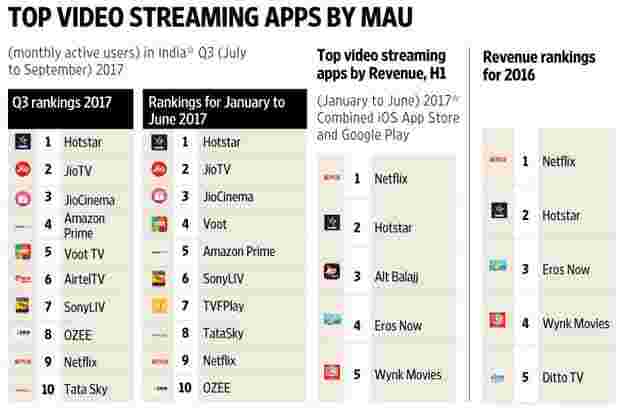 “Between January to June 2017, India saw the highest two-year growth in average monthly active users (MAU) for the top five video streaming apps, increasing more than 100%. This was more than twice the rate of other countries analysed in APAC (Asia-Pacific), and home-grown players are driving this push," said a report published by App Annie last month. In fact, data usage in India has more than doubled, driven by the strong adoption of mobile devices and major improvements to cellular coverage.